Woods Hole Research Center, the world's #1 Climate Change Think Tank is hosting a Gala Fund Raiser and The Marlene Jazz Ensemble is proud to be part of this event. As a nod towards research done in the Amazon Rainforest, The Marlene Jazz Ensemble will be performing Brazilian and jazz. Featuring: Marlene del Rosario (Philippines)- vocals/keys, Richard Viard (France)- guitar, Ririka Tokushige (Japan)- woodwinds, and Renato Malavasi (Brazil)- percussion. The Brazilian Project will be performing their versions of Brazilian tunes we all love. 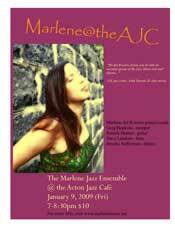 Featuring The Marlene Jazz Ensemble with Marlene del Rosario, Ririka Tokushige, Dave Landoni, Renato Malavasi. It's a special event with all sorts of activities for the whole family throughout the day. The Marlene Jazz Ensemble caps the day with a concert under the stars at 5pm. Framingham's fine Vietnamese cuisine, Pho Dakao offers scrumptious jazz on Friday nights in addition to good eats. Doug Rich on acoustic bass and Renato Malavasi on drums join me for the evening. Special Guest, Richard Viard will be joining us on a few sets. If you're in the area, come celebrate New Year's Eve and countdown into 2017 at one of the Cape's grandest hotels, Chatham Bars Inn. Doug Rich (bass) and Renato Malavasi (drums) are joining me. Visit Chatham Bars Inn website for more details. The new rising star of gourmet pizzas, Oath Pizza Brookline will feature Marlene (vocals) & Patrick (guitar) for their Happiness Hours, 4-7pm, performing jazz, originals and Brazilian tunes. Get hip. Cool Pizza, Cool Music, Cool Vibes. The Marlene Jazz Ensemble will be performing at the fabulous Endicott Estate for the Arts at Endicott Summer Series. Joining me are Ed Harlow, Doug Rich, Renato Malavasi and special appearance of Richard Viard from The Brazilian Project. Free outdoors concert. For more info, see flyer. The Brazilian Project. featuring Marlene on vocals/piano and Richard Viard on guitar, reprises for a larger audience in this huge outdoors area. Marlene & Richard will be joined by friends, Willie Sordillo, Doug Rich, Renato Malavasi and Zoë Daggett Krohne. The Brazilian project is a partnership with Marlene and Richard collaborating on Brazilian tunes they know and love. Free outdoors event. The Brazilian Project, a partnership by French guitarist, Richard Viard, and Filipino vocalist/pianist/percussionist, Marlene del Rosario will present a collection of Brazilian tunes in the intimate concert setting of Framingham's gem, Amazing Things. Marlene and Richard grew up with Sergio Mendez and Jobim so a lot of their tunes will be featured in this concert. Once again, The Marlene Jazz Ensemble kicks off Worcester Polytech Instsitute's (WPI) Summer Concert Series performing originals, jazz and Latin tunes. Joining her are Willie Sordillo on sax, Doug Rich on bass and Renato Malavasi on drums. Check out the brief article from last year where we also started the concert series. The Marlene Jazz Ensemble performs at the 2017 Sail Boston courtesy of Boston Harbor Hotel. We'll be on the barge on the pier in front of the hotel. Check out the Tall Ships and be part of the festivities which run from June 17-22. Marlene will be joined by Ed Harlow on sax and Dave Landoni on bass. For more info and full schedule, visit Sail Boston website. In case you're etraveling and happen to be at Logan Airport on the dates above, say hello! Marlene and friends have been giving cheer to irritable travelers waiting to get the hell out of town. :) So if you happen to be in a long queue, don't pout, 'coz I'm gonna sing, "Santa Claus is Coming to Town!" Patrick Mottaz (guitar), Willie Sordillo (sax). Dan Fox (bass) Ed Harlow (sax) join me on different dates. In this benefit concert for victims of Louisiana flooding and Hurricane Matthew in Haiti and the Caribbean, Marlene partners with Richard Viard in a unique collaboration of Brazil tunes. In addition to singing in Portuguese, Marlene will be playing percussion and Richard will be on acoustic guitar. Special guests Willie Sordillo Ensemble, Buddy V and Michael Greatzer will help make the event spectacular. Marlene joins the Willie Sordillo Ensemble in this special concert celebrating peace and harmony in these troubled times. Ticketed event. Framingham's fine Vietnamese cuisine, Pho Dakao offers scrumptious jazz on Friday nights in addition to good eats. Doug Rich on acoustic bass and Renato Malavasi on drums join me for the evening. It's Summer and a great time to be out, so come and join us! The Marlene Jazz Ensemble kicks off Worcester Polytechnic Institute's summer concert series with Willie Sordillo on sax, Dave Landoni on bass and Renato Malavasi on drums. It takes a village to produce a concert in Canezac, France. And Marlene performs her first European concert in a lovely 200 year old barn converted to a jazz lounge for the evning. Joining her are special and surprise guests. Auberge de Espanol. The Marlene Jazz Ensemble provides elegant ambiance for the Fairmont Copley's HOLIDAY Bacchanal series featuring a lavish five-course menu from Executive Chef Laurent Poulain with special wine pairings from Stefanie Korman, the hotel's wine consultant. The hotel's dramatic lobby will be transformed into a sophisticated garden party with guests dining at a farmer's table running the length of the lobby. Ticketed event. Willie Sordillo Quartet featuring Willie Sordillo (sax), Marlene del Rosario (vocals/keys), Renato Malavasi (drums) and Doug Rich (bass) will be performing at the Swampscott Town Hall. We will be doing original tunes and rearrangements from Willie and Marlene. Framingham's new addition to fine Vietnamese cuisine, Pho Dakao recently opened its doors in March and now offers scrumptious jazz on Friday nights in addition to good eats. Come join us! Doug Rich joins me on acoustic bass for the evening. It's Summer, what are you waiting for? The Marlene Jazz Ensemble kicks off Worcester Polytechnic Institute's summer concert series. The Marlene Jazz Ensemble provides elegant ambiance for the Fairmont Copley's SUMMER Bacchanal series featuring a lavish five-course menu from Executive Chef Laurent Poulain with special wine pairings from Stefanie Korman, the hotel's wine consultant. The hotel's dramatic lobby will be transformed into a sophisticated garden party with guests dining at a farmer's table running the length of the lobby. Ticketed event. Framingham's new addition to fine Vietnamese cuisine, Pho Dakao recently opened its doors in March and now offers scrumptious jazz on Friday nights in addition to good eats. Come join us on April 10. Awesome sax player and friend, Willie Sordillo joins me for the evening. It's Spring, what are you waiting for? The Marlene Jazz Ensemble provides elegant ambiance for the Fairmont Copley's SPRING Bacchanale series featuring a lavish five-course menu from Executive Chef Laurent Poulain with special wine pairings from Stefanie Korman, the hotel's wine consultant. The hotel's dramatic lobby will be transformed into a sophisticated garden party with guests dining at a farmer's table running the length of the lobby. Ticketed event. The Marlene Jazz Ensemble provides elegant ambiance for the Fairmont Copley's first Winter Bacchanale featuring a lavish menu from Executive Chef Laurent Poulain with special wine pairings. Ticketed event. First Church Somerville, UCC, brings to you "Marlene and Friends," a benefit concert for the victims of Typhoon Haiyan. Marlene will be joined by Willie Sordillo (sax), Patrick Mottaz (guitar), Doug Rich (bass) and Renato Malavasi (drums). In addition, a Filpino meal cooked by Marlene and Theresa Carunungan will be available for sale from 12:30-1:30pm. Concert begins at 1:30. The cost of the FILIPINO MEAL is $15 adult, $10 student/elder/low income, $5 children under 12, free for children 5 & under. Proceeds from the concert will be donated through Wider Church Ministries of the United Church of Christ. First Congregational of Somerville, UCC, 89 College Avenue, Somerville, MA. For more info, visit United Church of Christ. Free parking is available. No where to go on the last day of the year? Head out to Boston Harbor Hotel's Sea Grille and join The Marlene Jazz Ensemble counting off into the New Year! Boston Harbor Hotel. 70 Rowes Wharf, Boston, MA. Call 617-439-7000 for reservations and more info. Don't feel like traveling far for Thanksgiving? Not in the mood to cook? Well then head off to Boston Harbor Hotel's Atlantic Room for some scrumptious brunch! The Marlene Jazz Ensemble will entertain you while you relax and enjoy your feast. Manuel Kaufmann (bass) and Ririka Tokushige (sax) join me! Boston Harbor Hotel. 70 Rowes Wharf, Boston, MA. For more info, call 617-439-7000. Manuel Kaufmann (bass) and Renato Malavasi (drums) join me! The cool Doug Rich joins me on bass! Manuel Kaufmann joins me on bass. Ed Harlow joins me on saxophone. Dave Landoni on bass and Renato Malavasi on drums join me. My usual partner-in-crime, Patrick Mottaz, joins me on guitar. Doug Rich on bass and Brooke Sofferman on drums join me. Mr. Cool himself, Doug Rich, joins me on bass. Coolness- personified, MrDoug Rich joins me on bass. Too much partying from the night before? You can't stop now---start the new year right and party with us and enjoy a decadent display of breakfast and specialty items at Meritage. Here you can enjoy spectacular water views and impeccable service as you celebrate the very first day of the New Year. Pastry Wrapped Salmon & Nantucket Scallops with a Baby Shrimp Cream, Pepper Rubbed Slow Roasted Prime Sirloin with Caramelized Onion Au Jus or Sour Cream and Cranberry Pancakes served with warm Vermont Maple Syrup are just some of the delectable offerings you will savor at Meritage. And don't forget, music from The Marlene Jazz Ensemble to ensure your digestion works just right. Bass player extraordinaire, Dave Clark and Brazilian rhythm master Renato Malavasi on drums, will be joining me. Take a break from holiday cooking! Celebrate the last day of the year at Boston Harbor Hotel's Sea Grille where Chef Daniel Bruce will plump you up with his four course prix fixe menu just before your new year's resolution to lose weight. Of course The Marlene Jazz Ensemble will keep you company and serenade you with our signature brand of jazz and originals, spiced up with some holiday music to boot. Big band composer and arranger, Manuel Kaufmann, will be joining me on bass. Find an oasis from a hectic day at Jazz Worship Thursdays at Old South Church. Willie Sordillo heads the music ministry and I will be joining the group for three consecutive Thursdays. It's a calming, meditative space where all are welcome. What do you get when you cross the music of Irish rock band U2 with a Communion service? A “U2charist!” The program, which features the music of U2 performed by the Willie Sordillo Band (including Pastor Lisa... on vocals) is far more than “church with a twist." As with all U2charist services, the event is offered to fight hunger. One hundred percent of the proceeds of the free-will offering will benefit local disasters. In addition, people are invited to bring a non-perishable food item. Truly, this is not an event that you want to miss, with professional musicians from the Boston area including Marlene Del Rosario on piano, Patrick Mottaz on guitar, Willie Sordillo on saxophone, and Hilmar Lehnert on bass guitar, and Kyle Alspach on drums. DreamFarm Café radio is a unique experience of eclectic jazz music providing an intimate window into the very heart of an artist's creative process. It is a musical show for both sides of the brain: intuitive as well as analytical. For this program, Marlene performs solo and is interviewed by host and founder, Julie Lavender. For Boston Jazz Week, Marlene del Rosario sings and plays originals and jazz standards in an intimate trio of piano, guitar and acoustic bass. Accompanying her are Patrick Mottaz on guitar and National Endowment for the Arts jazz awardee and Berklee professor, Dave Clark on bass. Zumix is East Boston's newest artsy and green venue for live music, housed in a renovated firehouse. Marlene joins the Dan Fox trio in Salem's hip venue, Finz. What do you get when you cross the music of Irish rock band U2 with a Communion service? A “U2charist!” And it’s coming to West Brookfield, for the first time ever. The program, which features the music of U2 performed by the Willie Sordillo Band (including Pastor Lisa... on vocals) is far more than “church with a twist." As with all U2charist services, the event is offered to fight hunger. One hundred percent of the proceeds of the free-will offering will benefit local disaster and Philippine flood relief. In addition, people are invited to bring a non-perishable food item. Truly, this is not an event that you want to miss, with professional musicians from the Boston area including Marlene Del Rosario on piano, Patrick Mottaz on guitar, Willie Sordillo on saxophone, and Hilmar Lehnert on bass guitar, and local musician Chris Glanville on drums. Sax man, Willie Sordillo leads the U2charist benefit for Massachusetts flood victims. If you haven't been, it's a U2 sing-along benefit sponsored by the church and loads of fun. Yes, yes, you might ask, "Does Marlene play U2?" In a former incarnation, I was actually in a "New Wave" band in Manila, which covered U2 and Echo and the Bunnymen (among others) and had a few goth followers. It's been awhile so this will be fun. Details of gig TBA, but I do know Doug Rich on bass is joining us as well! Enjoy fine Italian dining and cool music. Marlene plays with the Dan Fox Trio at Hingham's Tosca. Enjoy fine Italian dining and cool music. Marlene plays pop and jazz with friends Manuel Kaufmann (bass) and Brooke Sofferman(drums) at Hingham's Tosca. Join The Marlene Jazz Ensemble at Boston's hippest bar and restaurant. Enjoy fine Italian dining and cool music. Marlene plays pop and jazz with friends Manuel Kaufmann (bass) and Renato Malavasi (drums) at Hingham's Caffe Tosca. Marlene jazzes it up at the Hilton Garden Inn in beautiful downtown Portsmouth. It's summer time and Marlene gets to play again at the Piers Park Concert series, organized by Zumix! Marlene (vocals/piano) will be joined by friends, Patrick Mottaz (guitar), Dave Landoni (bass) and Renato Malavasi (drums). Look for sunshine! Check out Zumix's website for more info. Directions at Piers Park page. Jazz for JAPAN, a jazz benefit concert for Japan tsunami victims for Boston Jazz week. Vocalist, pianist and composer, Marlene del Rosario is joined by friends in this jazz benefit for Japan, held in cooperation with Zumix. The Marlene Jazz Ensemble will be performing a lively repertoire that mixes jazz, latin, originals and re-arrangements of Marlene's favorite pop tunes. Willie Sordillo (sax), Mike Carey (sax), Doug Rich (bass), Patrick Mottaz (guitar), are some of the friends who will join Marlene. Tickets are $10 and available online at Ticketsonline or at the door. Zumix Firehouse 260 Sumner St., East Boston, MA 02128. For more info, visit Zumix and JazzBoston websites! A reunion for The September Jazz Quartet! Originally put together by drum guru, Stanley Swann, this quartet made its debut this September at the Acton Jazz Cafe. It features Willie Sordillo on sax, Doug Rich on bass, Stanley Swann on drums and myself on vocals and keys. Each of us brings tunes to the repertoire, including tunes from artists likeJimi Hendrix, Sting and Joni Mitchell and render our own versions of it. The repertoire for the evening will be fairly eclectic, anything from Latin Jazz, straight ahead swing and bop, and our jazzy takes on aforementioned artists. It will be fun! 2 Great Pond, North Andover at the Old Center Hall. For info, please visit website. Enjoy fine Italian dining at Hingham's Caffe Tosca with The Marlene Jazz Ensemble. Marlene will be joined by Dave Landoni (bass) and Renato Malavasi (drums). Marlene del Rosario on piano and vocals! Good friend and sax player, Willie Sordillo lines up a few friends (including me!) to perform for a Chilean Earthquake Benefit. It's summer time and Marlene gets to play again (weather permitting!) Piers Park Concert series, organized by Zumix! Weather permitting, Marlene will be jazzing it up at Rye's historical Saunders Deck. Marlene and Patrick are back at the fantabulously fun Club Cafe for an evening of songs. Please note, the calendar has me on a different date than this. A bunch of friends, coordinated by sax player,Willie Sordillo, will be performing for the Haiti Benefit at the Boxborough United Church of Christ. Come join us for an evening of solidarity with music and Haitian cuisine, and help wipe out those winter blues! Suggested donation: $5/person; $10/family. Count down to New Year's at the Boston Hyatt on Lafayette Ave! Marlene will be joined by Jamie Stewardson on guitar for some jazz, originals and holiday music. 1 Avenue de Lafayette, Boston, MA. For more info and directions, visit The Terrace at Avenue One at the Hyatt. Lush vocals accompanied by acoustic magic describes this group’s versatile, stylish repertoire ranging from jazz standards of Ella Fitzgerald to the Bossanova. From royalty to presidents, this group has international cache and loyal following. Performers joining Marlene are Patrick Mottaz on guitar and Greg Loughman on acoustic bass. After last January's SRO performance, Marlene returns to one of New England's top jazz venues, the Acton Jazz Cafe, recently listed in Downbeat Magazine's "100 Great International Jazz Clubs". Joining Marlene are Greg Hopkins (trumpet), Patrick Mottaz (guitar), Mark Poniatowski (bass) and Brooke Sofferman (drums). They will perform new arrangements and originals, and of course, some favorites from Marlene's previous CDs. $12 door ($10 online). Reservations suggested. Marlene performs solo in East Boston's Hyatt Harborside. The concert will be at the patio if weather is great, otherwise it will be located indoors. This is a wonderful hotel that has a magnificent view of Boston's Harbor. You can beat the traffic and travel via MBTA ferry to this hotel! It's summer time and Marlene gets to play again at the Piers Park Concert series, organized by Zumix! Marlene (vocals/piano) will be joined by friends, Patrick Mottaz (guitar), Mark Poniatowski (bass) and Renato Malavasi (drums). Marlene performs solo in East Boston's Hyatt. The concert will be at the patio if weather is great, otherwise it will be located indoors. 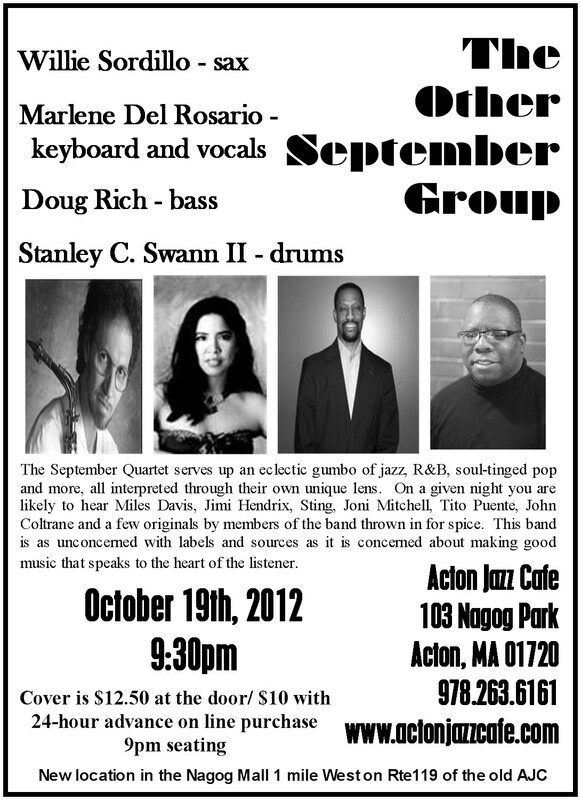 Join The Marlene Jazz Ensemble at Boston's hippest bar and restaurant. Marlene will be joined by Greg Hopkins (trumpet), Dave Landoni (bass) and Brooke Sofferman (drums). Join Marlene and Patrick at Boston's hippest bar and restaurant. Marlene joins the Willie Sordillo trio in this Martin Luther King benefit Concert. Doug Rich will be on bass.Proceeds will benefit FBC's work in El Salvador and Katrina recovery in New Orleans. $10-adults, $5- seniors,Under 12-FREE; Family discounts available at door. For more details, see flyer. The cast of Marlene's latest CD reassembles at one of New England's top jazz venues, the Acton Jazz Cafe, recently listed in Downbeat Magazine's "100 Great International Jazz Clubs". Joining Marlene are Greg Hopkins (trumpet), Patrick Mottaz (guitar), Dave Landoni (bass) and Brooke Sofferman (drums). $10 door. Marlene and Patrick liven up New Year's Eve at the Hyatt. Call for reservations. Enjoy fine Italian dining at Hingham's Caffe Tosca with the Dan Fox Trio. Marlene joins Dan on piano and vocals. Join The Marlene Jazz Ensemble at Boston's hippest bar and restaurant. Marlene will be joined by Doug Rich on bass and Sergei Ioannisyan on drums. Join The Marlene Jazz Ensemble at Boston's hippest bar and restaurant. Marlene will be joined by Patrick Mottaz on guitar and Doug Rich on bass. One of New England's newest and hottest live music venues , Showcase Live, presents The Marlene Jazz Ensemble from 6-8pm and The World Premier Band for funk and dance. Free hors'doerves and no cover before 8pm, $6 after. Joining Marlene are Mark Poniatowski on bass and Scott Golding on drums. This show is brought to you by Entertainment Specialists. 23 Patriots Place, Right next to Gillete Stadium, Route 1, Foxboro, MA. Visit Entertainment Specialists or Showcase Live for more details. Join The Marlene Jazz Ensemble at Brookline's jazz dining hangout! The evening's players are Lello Molinari on bass and Renato Malavasi on drums. Join The Marlene Jazz Ensemble at Boston's hippest bar and restaurant. Personnel: Marlene on piano and vocals, Renato Malavasi on drums and Manuel Kaufmann on bass. Enjoy the sounds of Latin and bossanova with The Marlene Jazz Ensemble at the Worcester Polytech Institute's Lunch Concert series! Marlene is joined by Greg Hopkins on trumpet and Dave Landoni on bass. Check out WPI's website for directions. Marlene joins saxophonist and composer, Willie Sordillo at the Holliston Summer Concert series. Details to follow! Boston's hippest bar has Sunday Jazz brunches as well. Check out The Marlene Jazz Ensemble at the Beehive. Joining Marlene are Dave Landoni on bass and Renato Malavasi on drums. Jazz in July brings together Boston's finest musicians in a series of free concerts all over Boston. The Marlene Jazz Ensemble will be playing Friday nights this month (except July 4th) at The Terrace Avenue One at the Hyatt. If you haven't been, it's a cozy outdoor restaurant and bar lounge that's an oasis in the midst of Downtown Boston's concrete jungle. Joining Marlene are Dave Landoni on bass and Renato Malavasi on drums on the 18th and Justin Meyer on bass and Renato Malavasi on drums on the 25th. 1 Avenue de Lafayette, Boston, MA. 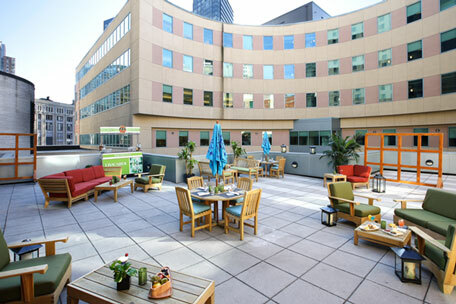 For more info and directions, visit The Terrace at Avenue One at the Hyatt website or the Jazz in July website. It's summer time and Marlene gets to play again at the Piers Park Concert series, organized by Zumix! Marlene is joined by Patrick Mottaz on guitar, Dave Landoni on bass and Brooke Sofferman on drums. Check out Zumix's website for more info. Directions at Piers Park page. Jazz in July brings together Boston's finest musicians in a series of free concerts all over Boston. The Marlene Jazz Ensemble will be playing Friday nights this month (except July 4th) at The Terrace Avenue One at the Hyatt. If you haven't been, it's a cozy outdoor restaurant and bar lounge that's an oasis in the midst of Downtown Boston's concrete jungle. Joining Marlene are Dave Landoni on bass and Brooke Sofferman on drums. Check out Brockton's hottest new fine dining and live music at Tamboo Bistro Ultra Lounge. The Marlene Jazz Ensemble featuring Dave Landoni on bass and Renato Malavasi on drums will play. The Marlene Jazz Ensemble plays at Manila's new jazz bar. Marlene on vocals and piano will be joined by session artists, Colby de la Calzada (acoustic bass), Fritz Barth (drums) and Anthony Morris (sax). Marlene del Rosario performs at the Philippine International Jazz Festival in Manila, Philippines. Joining her are Anthony Morris (sax), Dave Harder (acoustic bass) and Arwin Nava (drums & percussion). She will open for renowned Cuban pianist, Omar Sosa.This is an exciting event which will also feature Kurt Elling, Lee Ritenour and many more! Come and join Marlene and friends as we record Marlene's second CD, LIVE! This will be Marlene's second CD under Blue Earth Music scheduled for release Spring 2008. Joining her are New England's foremost musicians, Patrick Mottaz (guitar), Dave Landoni (bass), Brooke Sofferman (drums) with special guest, Greg Hopkins (trumpet). Special: Pre-order CDs by Dec. 31, 2007, and if you're in the first 30, you can come in for FREE (because of limited seating). You can order your CDs at a special price through the Pre-order page and if you can attend the concert, let Marlene know so she can put you on the guest list. As this is a live recording, doors will be closed at 7:15pm and will reopen on the break at around 8:30pm.